Rethink Robotics, the pioneer that first put a face to the cobot with Baxter (2012), has closed its doors. Last-minute rescue attempt ends abruptly. “This is too good a cobot and too good a cobot maker to end its story on the slag heap of failed robotics. In September of 2012, a large, non-descript box was secreted into a hotel in Pittsburgh, opened, and its contents assembled. 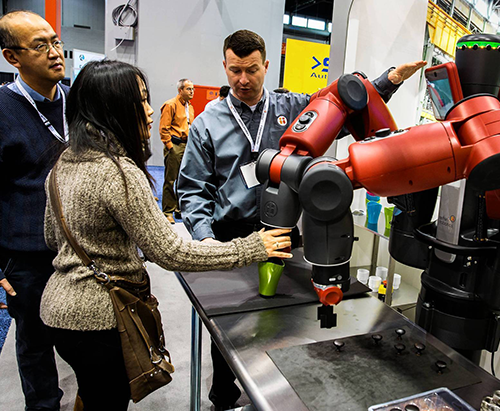 Those contents turned out to be the first public showing of a revolutionary collaborative robot named Baxter. Back then, a mere six years ago but an eternity in tech time, robots were still robots. The contracted word “cobot” from collaborative robot was still contracting its way into the dictionary through IEEE HRI events, short for Human Robot Interaction. HRI events were known for their strange-looking experimental contraptions that rubbed shoulders with humans without bloodshed. Their makers dubbed them collaborative robots. Strangely, the collaborative robot movement seemed stuck, as if trapped and never able to break free from being just an amusing sideshow at HRI events. It needed a jolt into the real world if it was ever to make something of itself, but no one was stepping up to take on that challenge. It took a celebrity roboticist like Rod Brooks, millions of investment dollars from people who believed in Brooks’ vision of a friendly robot (totaling $150 million; the last $18 million chunk coming in January of 2017(Crunchbase)), and his newly launched company Rethink Robotics, to push Baxter onto that stage in Pittsburgh. Dual-arm Baxter with an animated screen for a “face” caused a firestorm of excitement in Pittsburgh; throngs crowded around the machine taking selfies with it, thrilled that a real, honest-to-god collaborative robot was at long last going to market for the very first time. Immediately following the unveiling, global news outlets went electric reporting on Baxter; even 60 Minutes asked for an audience with the new prince of the production line. Although chunky looking and slow Baxter burst into the marketplace with high expectations; here was a real collaborative robot for all the world to see…and to safely use. It took Brooks’ celebrity status and his ability to raise financing to push the cobot market onto the world stage. After Rethink launched Baxter, it followed up with the smaller, cheaper, and stronger Sawyer in 2015. Now, nearly six years to the day from Baxter’s coming out party, Rethink Robotics has closed its doors and is out of business. “We thought that we had a deal that we were going to be able to close,” Rethink’s CEO Scott Eckert told the Boston Globe, but the buyer backed out. Eckert said that Rethink ran low on cash as sales of the company’s Baxter and Sawyer robots fell short of expectations. Even as a $3-an-hour worker, Baxter just never seemed to catch on in enough numbers to make it a viable contender for permanence and leadership in cobotics. There’s no recorded evidence that Baxter ever met up with the cobots from Universal Robots (Denmark). That two cobots could be so different is startling. The difference in popularity and sales is also startling: Universal Robots is spectacularly successful; it just sold its 25,000th cobot. That most cobots today look and act more like Universal Robots’ machines hints at maybe why Baxter never did as well as expected in sales. Baxter just might be too different and also not enough of an automated tool to compete successfully. 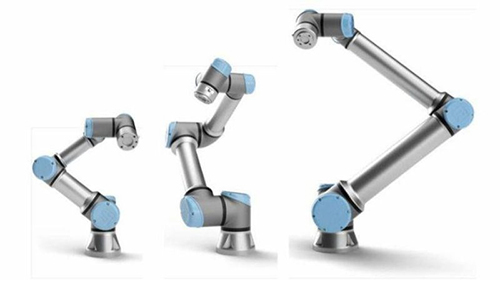 Baxter, in comparison to the field of successful cobots, seems like a branch of cobot evolution that went in the wrong direction…and then abruptly ended. The homo habilis of cobots. Baxter’s true calling, and quite possibly a direction where evolution may allow it to flourish, might well be as an educator. In some respects, Baxter is the product of an educator. Rod Brooks, although co-founder of iRobot in 1990, followed by Rethink Robotics in 2008, has spent much of his professional life in academia. For years he was Panasonic Professor of Robotics at the Massachusetts Institute of Technology and former director of the MIT Computer Science and Artificial Intelligence Laboratory. 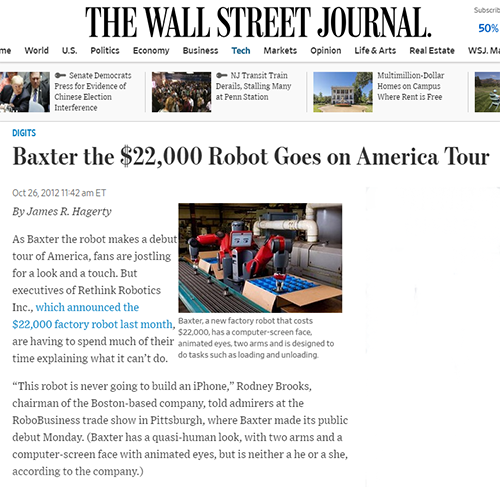 Baxter looks to be the product of an academician rather than a toolmaker; a cobot more at home in a teaching lab than on a production line. It looks more like Willow Garage’s PR2 than the market-preferred cobot arm like those from Universal Robots. Of the forty-odd makers of cobots, the vast majority have built a product similar to Universal Robots. There’s a reason for that: These machines are good at what is needed on production lines…even though some might be more expensive than Baxter. 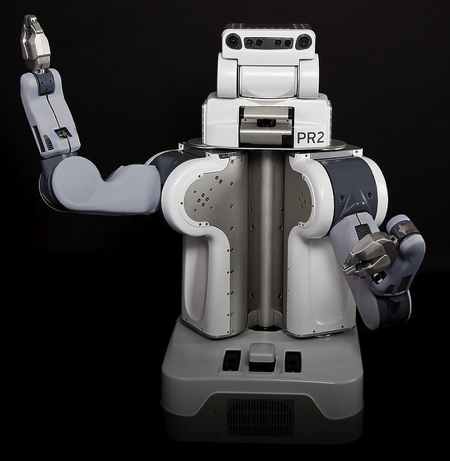 Just as the PR2 became the premier teaching platform for robotics, maybe Baxter should follow in the same footsteps. Baxter might well thrive as a high-end, training machine for future generations of roboticists…maybe like medical students sharing a cadaver. At $22K per machine, every college, university and technical training school should have at least one Baxter. If so, that’s a ton of potential sales.